In memory of Chrissie, we're hosting an AWESOME, huge outdoor yard sale this Saturday (May 5) to benefit orphans worldwide! 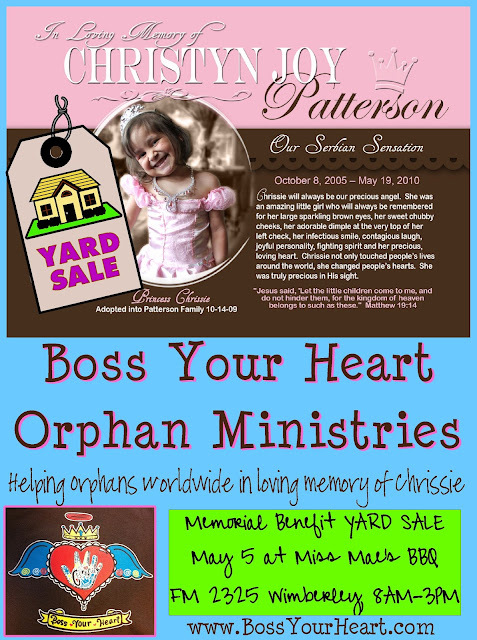 If you’re in the area, come by to say hi, show your support, and donate to make a difference in the life of an orphan. It’s Wimberley’s Market Days that day, as well, so come out to the beautiful hill country for some great shopping while showing your support, in memory of Chrissie. There are an estimated 163+ million orphans in the world who need our help. Thank you for your support and we hope to see you this Saturday!